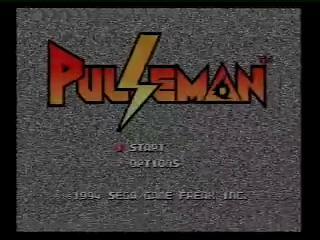 Pulseman is a 1994 Genesis/Megadrive game, originally available in the west only as a Sega Channel exclusive. Perhaps 'not available' would be more appropriate. The game later received a Wii Virtual Console release in all territories. Pulseman, the child of a forbidden AI-Human romance, must defeat the Galaxy Gang his insane father created and save the world from poorly-named cyberterrorism. Best time with large-skip glitches: 0:31:34 by Nick 'Axon' Beaudette on 2012-03-07. Hello! This is a speedrun of Pulseman for the Genesis. I'm playing on the Wii Virtual Console, which is the only official American release of the game outside of Sega Channel. This is my first submission so I'm not really sure of the general format that these comments are supposed to be in, so I'll just start off by explaining all of the major tricks and then I'll go over the run itself. Skid Jump Glitch - The main glitch that you'll see in the run. It is performed by skidding (moving right and then quickly turning around), jumping, and pressing right. This will result in Pulseman moving very fast to the left side of the screen. You can then change directions by pressing left, and then right very fast. This is very difficult to do on a d-pad but is slightly easier on a control stick. This can be made even easier by using the control stick and the d-pad at the same time on a Classic Controller. Do the skid jump using the control stick, then hold right on the control stick and quickly tap left on the d-pad. This move can also be performed by skidding off an edge instead of jumping. About the classic controller thing: Before my run gets rejected for left+right, I should explain that it isn't actually left+right. The classic controller prevents left+right for obvious reasons. The reason why controlling the d-pad and control stick at the same time works is because when you use the d-pad while holding down the control stick, the d-pad will override it. Then, when you let go of the d-pad, the control stick resumes control. No actual left+right is being done. I posted a thread about this on the forums to make sure it was legal and Mike gave me the okay. Another major aspect of this glitch is that if you use a Volteccer during it, not only will it be extended by a considerable amount, but it will also render Pulseman intangible for a short time, allowing you to move through enemies and walls. Skidding - Okay, this is the most frustrating part of this game by far. There appear to be three types of skids. 1-frame skids, medium skids and long skids. Long skids will always consistently work, as long as you are running at full speed when you turn around. Turning around from a standstill or from a very low speed will give you a 1-frame skid. The problem with running Pulseman are the medium skids. Generally, you want to get a medium skid when you want to do a skid jump glitch but you don’t have enough space to get running speed. However, Pulseman has the annoying habit of randomly giving you 1-frame skids instead of medium skids! It makes it really annoying to try to pull off the glitch on small platforms, and you’ll probably notice a couple times in the run where I struggle with this. Thankfully it doesn’t lose that much time, but it’s still incredibly frustrating. Sparking - Pressing A without a charge will cause Pulseman to do a spark attack with very poor range but very high attack power. Some bosses can be killed very quickly with this attack. In addition to the damage, sparking will also cause Pulseman to become invincible for about one second. This can be very heavily abused. Skipping Vertical Areas - Most rooms in Pulseman are programmed so that leaving the right side of the screen will cause you to move to the next area. In vertical sections, they force you to ascend/descend by blocking off the right side until you reach the top/bottom of the level. However, most vertical sections can be skipped simply by doing a skid jump Voltteccer towards the right side of the screen. Leave Rooms Early - For unknown reasons, doing a skid jump Voltteccer in certain rooms will cause the player to exit the area and advance to the next room even if the player is nowhere near the right side. This occurs in 4-31, 4-33, 6-1, 6-2, 7-3, and 7-4. 1-311 Cutscene Skip - Normally, in 1-311 you have to punch the boss and a cutscene will play of his equipment exploding. However, you can skip this cutscene by doing a skid jump Voltteccer to the left and entering the jack-in point. This will take you straight to the newscast cutscene. That explains pretty much all of the major tricks. Now the run itself. Japan - Went pretty well. Other than missing a couple skids and losing a tiny bit of time, this was a very standard run. The computer area is particularly interesting. I glitch inside the left wall and zip up it to get above the level, that way I can just jump over the rest of the level without having to deal with the obstacles underneath. The boss fight went well and I got the cutscene skip very fast. India - This was one of my best runs of this level. I remember I actually gained 3 and a half seconds over my previous run. At the beginning of the level, I pretty much skip all of the major stuff, making this level very fast compared to when played legitimately. The second section is a vertical section but I can also completely skip that just by glitching through the right wall. The digital forest section usually gives me a hard time but I only missed a few skids. The rest of the level went fine and I killed the boss in two cycles which is my average. The TAS kills him in one but I’ve never managed to do it in real time. USA - This level is my only regret. I suppose every run has to have one major mistake, huh? The boss at the start just kind of destroyed me, and I barely got away with 1 health. By the way, even though it looks like I’m just sitting there taking the hits, I was actually mashing A trying to spark him and it wasn’t working due to a rare glitch that happens on certain sections. Jumping canceled it and allowed me to kill him. I lost about 5 seconds here. The rest of the level was standard, though. The end boss is really easy. Australia - I do Australia first because it’s the hardest. That’s the only reason. Anyways, this level went pretty well. I make some small mistakes with skids and stuff but overall it was a good level and I gained about a second and a half over my previous run. The underwater falling section is neat to watch because I don’t touch the ground at all after the second platform. Note regarding bonus stages on Australia, Thailand and Alaska: They aren’t worth it. The bonus stages take a long time to complete, and most of the time, completing them will actually LOSE time. I once had a really great run on the Australia bonus stage with 9 time units remaining. You want to know how much time I gained in real time? A second and a half. And that rarely happens. Most of the time I finish with 2 or 3 time units remaining, if I even finish at all. The time loss comes from lag created by destroying the blocks, along with the time it takes to count up your points at the end and for Pulseman to do his ending animation for clearing the bonus stage. I decided it was too much of a risk just for such a small reward. Thailand - I got a visual bug at the start of this level and I’m actually really happy I got it on this run because it’s really hard to do. You have to press A on the first frame of the cutscene and it will cause Pulseman to use his Volteccer and glitch up the screen. It doesn’t serve any real purpose besides entertainment. Anyways, the actual level went very well. This level and Alaska were probably my two biggest improvement over my previous run. My only real mistakes were missed skids. This level has a really cool jump in the first section, and a vertical section which I skip immediately. Two of the computer sections can also be skipped just by doing skid jump Volteccers, and the boss is a pushover. Alaska - Probably the least glitched level in the game. The vertical sections can’t be skipped, and most of the other sections don’t really benefit from glitching because they are so tightly packed. I missed a couple Volteccers on the boss but recovered quickly. The stage in general went a lot faster than my previous best. Japan 2 - Yay, autoscrollers! Not really much to explain here. I skip the Volt powerup in the first section because it costs time to pick up and without it, I can just abuse spark to avoid getting hit. The boss at the end of the last autoscrolling section is kind of weird. Sometimes he dies in one hit, sometimes he takes more. But he died in one hit this time. Final sections - I skip two of the final areas using the early exit glitch, and the other area is a vertical section that can’t be skipped. I got kind of tripped up by the bubbles for a second but recovered fast. Both of the final bosses are pushovers. The first one can be abused easily by using the jumping kick attack (dubbed “the uberkick” by anees and I, due to the fact that Pulseman is completely invulnerable during it) and the second boss dies to sparks very fast. I assume timing ends once you lose control at the white screen, but I could be wrong. Hsanrb, aneeslol, Venick409, Oshxmir, Surreal, Logear, Yoshiiscool, Gerfuggery, and AND4H, and other people who I forgot.